June 23rd, 2016 | Pledge to Resist! 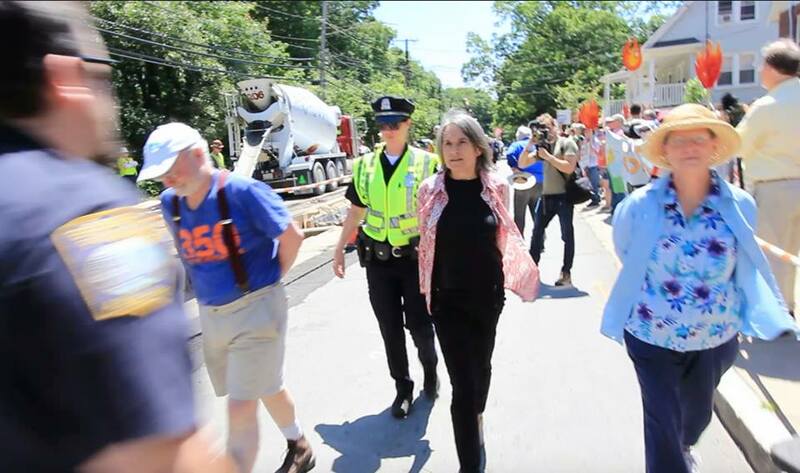 West Roxbury, MA – 26 people were arrested for disrupting cement pouring at the construction site of the controversial West Roxbury Lateral pipeline. The West Roxbury Lateral is part of Spectra Energy’s massive pipeline expansion project, which aims to transport gas from the shalefields of Pennsylvania through the Northeastern United States to Canada, where several large Liquefied Natural Gas export terminals are being built. This project has been met with massive public dissidence from local residents of West Roxbury and their many allies. In addition to the 26 arrestees, at least 100 sang, chanted, held banners and stood in solidarity with them as they were handcuffed and driven away in police wagons. Organizers are expecting upwards of 125 people to risk arrest over the course of the week and hundreds more to rally in support of this week of actions, which they are calling, “Escalation Summer”. Organizers, activists and resisters are attempting to halt construction on this project before it reaches the Metering and Regulating station which is directly across Grove Street from the entrance of West Roxbury Crushed Stone Co, a quarry blasted with dynamite about once each week, causing earthquake-like tremors. A blast did occur right before 2 pm today. According to local resident, Bill Kessler, residents are being forced to adapt to a new threat from the pipeline. Beginning at 10 a.m. the 26 resisters stopped construction for 2 hours by entering the construction site on Grove St. in waves of 2-4 people at a time. All the arrestees will be arraigned at 9 a.m. Friday in the Wes t Roxbury Courthouse. 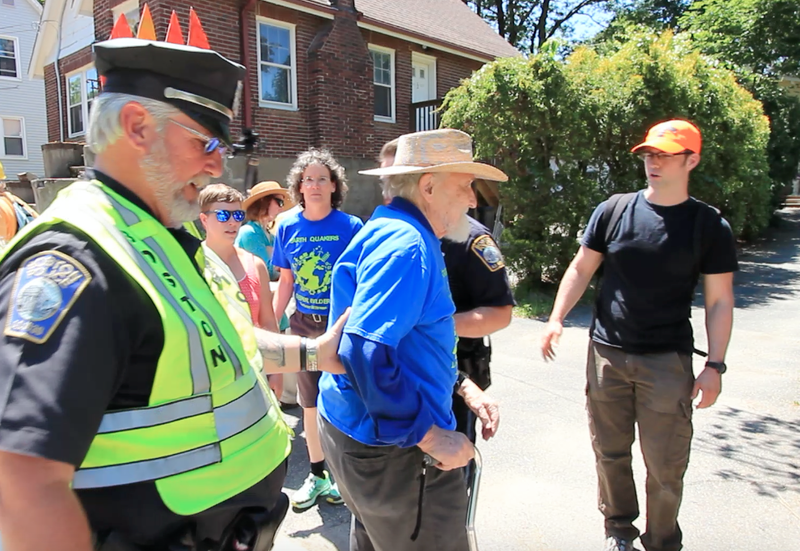 “I’m doing what I think is right” says Severyn Bruyn, an 82-year old quaker who stood with his cane onthe construction site after the police denied him access to his chair. “Gandhi said no matter what the consequences, if you succeed or fail, you’ve got to do what’s right”.